One of the most remarkable events in sacred history was the appearance of Jesus Christ to the Nephites at the temple in Bountiful . It was remarkable not only for the visit of the Savior but also for the outpouring of the Holy Ghost that occurred at that time. We should see this account in 3 Nephi as a “temple text,” in John Welch’s words, “one that contains allusions to the most sacred teachings and ordinances of the plan of salvation . . . presented in or near a temple.” “2 The purpose of the mission of Christ at that time to those people was to help them enter into sacred covenants that would entitle them to the aid of the Holy Ghost in returning to the presence of God. Just as we enter the temple to take sacred covenants, so did the Nephites receive sacred covenants at the temple in Bountiful. 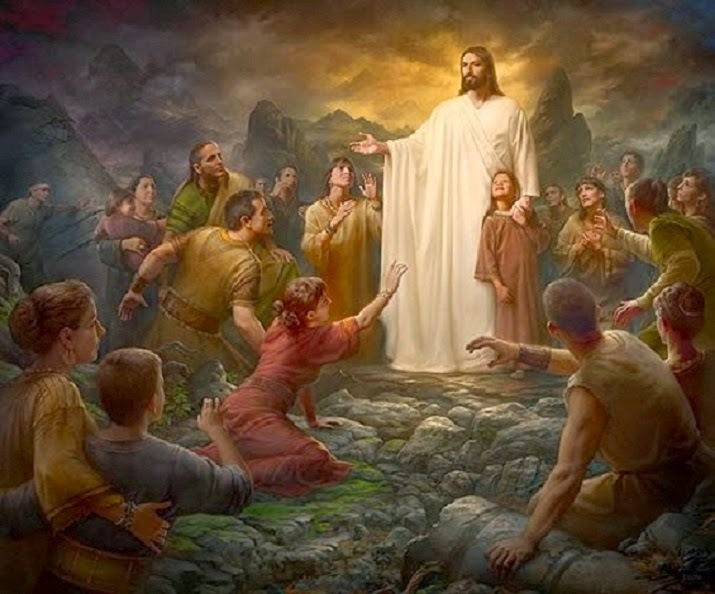 “Behold, I am Jesus Christ, whom the prophets testified shall come into the world,” He announced, and then invited each individual to come forward and “feel the prints of the nails in my hands and in my feet, that ye may know that I am the God of Israel.” 3 Thus each person received the tokens of the Atonement, “going forth one by one,” as all of the faithful will do when they come into the presence of the Lord. Each person who was afflicted “in any manner” was healed that day, “the lame, the blind, the halt, the maimed, the leprous, the withered, the deaf . . . all them that were afflicted in any manner; and he did heal them every one.” 4 We are reminded that the temple, the House of Christ, is a place of healing both physical and spiritual, for those who are suffering in any way. “And they did all . . . bow down at his feet, and did worship him; and as many as could come for the multitude did kiss his feet, insomuch that they did bathe his feet with their tears.” 5 How many of us come into the presence of the Lord in his holy house with this attitude of worship? In this mighty prayer circle, Jesus “groaned within himself, and said: Father, I am troubled because of the wickedness of the people of the house of Israel .” Why did He groan? Because as He looked around on these faithful ones, He must surely have contemplated the vast numbers who were not there-the thousands who had been drowned, crushed, and burned up in the cataclysm that had befallen the land because of their wickedness. At the end of the prayer, they arose and Jesus said unto them: “Blessed are ye because of your faith. And now behold, my joy is full.” Why was His joy full? Because these beloved Saints had qualified themselves through their faithfulness to receive the fullness of the blessings He had come to offer them. “And he spake unto the multitude, and said unto them: Behold your little ones.” They looked around to see angels descend from heaven and “encircle those little ones about . . . and the angels did minister unto them.” 8 We should remember that this is a family circle, that whole families were present, “men, women, and children” together. Is it possible that those ministering angels were the ancestors of the families present? Is it possible that among those angels were just men such as Lehi, Nephi, Alma, departed faithful Saints who came to join their beloved posterity at this sacred moment? Is it possible that we are witnessing in this passage a great foretaste of the exaltation of eternal families in the presence of the Savior? Is it possible that this touching scene illustrates for us the ultimate fruit of the Atonement of Christ? Now, when the Holy Ghost fell on the multitude at the temple in Bountiful , the fire was the sign of its presence. “The Holy Ghost did fall upon them, and they were filled with the Holy Ghost and with fire. And behold, they were encircled about as if it were by fire; and it came down from heaven. . . . behold, Jesus came and stood in the midst and ministered unto them.” 12 He then prayed to His Father for them. The beauty of this sacred prayer circle so overwhelmed the writer of 3 Nephi that his tongue could not describe it. This is the significance of the House of the Lord to a Latter-day Saint. There we can go and experience what the children of Lehi experienced at the temple in the land of Bountiful . There we can meet in whiteness and joy with our Savior, communing with Him around His holy altar, and feel the fire of the Holy Ghost in our hearts. 2 John W. Welch, Illuminating the Sermon at the Temple and the Sermon on the Mount , Foundation for Ancient Research and Mormon Studies, 1999, p. 23. 3 3 Ne. 11:10, 14. 4 3 Ne. 17:7, 9. 10 3 Ne. 18:7, 11.